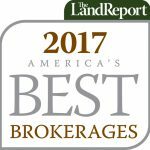 Congratulations to every member of the Potlatch Preferred Broker Network for making Land Report’s annual list of top land brokers for the 7th consecutive year!! And, for the first time, Potlatch Real Estate received top honors too!! For the Feature Article in a PDF, click here. 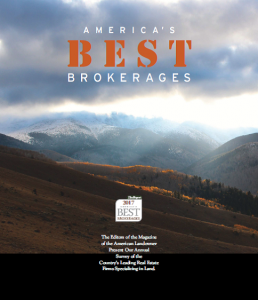 These ten brokerages have been named among “America’s Best Brokerages 2017” by the prestigious Land Report magazine in the sixth annual report. We’re proud that our brokers have consistently been included in the list since its inception. Brokers in the Potlatch Preferred Broker Network are experts in all aspects of recreational property sales. With decades of experience and deep knowledge of their geographic areas, they understand everything from what makes a quality hunting property to understanding how to ensure that a property fits a buyer’s exact needs. Congratulations to all. Keep up the good work! This entry was posted in Alabama, Arkansas, Awards & Recognition, Idaho, Minnesota, Mississippi, PotlatchDeltic and tagged #PotlatchLand, America's Best Brokerages, Hunting Land Sales, Potlatch Preferred Broker, Recreational Land Sales, Rural Land Sales, The Land Report, www.PotlatchLandSales.com. Bookmark the permalink.